Time to build a Pergola! Now is a great time to call F.A. Hobson Landscaping in to design and custom build your pergola! We build attractive, sturdy, and functional pergolas to make your outdoors stand out. A pergola is an outdoor feature that can serve various purposes, both practical and aesthetic-wise. It can function as an extension of your indoors and serves as a place of rest and relaxation. This can be made possible by installing furniture like an outdoor sofa set. It can also double as an events place where birthdays and small meetings can be held. It’s also possible to enjoy long idle hours under its shade, especially if it’s covered by vines and creeping plants. Meanwhile, the intricate latticework that pergolas are known for effectively makes them great additions to an outdoor area. A pergola installed in your patio area will increase livable outdoor space and be more relaxing. 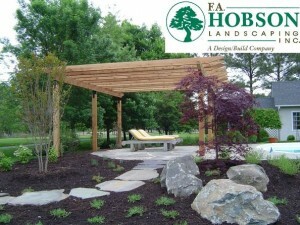 Build your pergola now and be ready to plant!